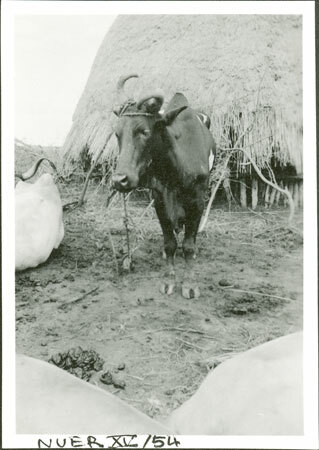 A portrait of a tethered ox (castrated bull) standing in a kraal near a byre (luak) . Evans-Pritchard describes this animal as a Thak ma, which refers to it being a castrated bull, and as bil ma gut, which refers to the patch of light markings on its side (bil), and trained left horn across its muzzle (ma gut). It is likely that this photo was taken in May 1935 after Evans-Pritchard had completed a survey of the Anuak. Note on print reverse ms pencil - "22 233 Akobo Thak ma (bil ma gut)" & print front border ms ink - "NUER XV/54"
Morton, Chris. "Nuer ox" Southern Sudan Project (in development). 03 Jan. 2006. Pitt Rivers Museum. <http://southernsudan.prm.ox.ac.uk/details/1998.355.727.2/>.